I finished it, the top that is.... yippee and woohoo.... with just hours to spare in the May deadline! It used up tons of my 1 1/2 inch strips. Unfortunately, about halfway through, I ran out of pieces long enough to make the blocks, so I ended up having to cut more. So I'm not too sure now, whether my pile actually got smaller or bigger. This quilt ended up being 92 inches square. I started this one back in January of this year, which isn't bad... five months, start to finish. It now gets to be added to the growing list of tops waiting to be quilted. It's from a book by Judy Martin called Scraps. This is the second quilt I've done from this book, and I have a third in progress that will probably become June's UFO to work on. I'm linking up to May's Lovely Year of Finishes party. I've made good progress on the Fly Away Hoodie I started last week. I've learned a couple of new things on this one, the provisional cast on being the biggest. This is a picture of the back. The shoulder seams were the provisional cast on parts. I'm now working on the left front, after picking up the stitches at the shoulder. This means that there are no seams at the shoulders, and the cables are continuous from front to back, which I think is really cool! There is also a provisional cast on used at the top of the button band. I'm assuming that it will be picked back up to go around the front edge of the hood, once I get that far. So far, the instructions are really good, and easy to follow. I'm linking up to Judy's On the Needles. This quilt belongs to Maureen. It's her version of Bonnie Hunter's Blue Ridge Beauty, and it is indeed a beauty. I love the variety of blues and creams in it. Apparently there was some swapping going on during and after our last guild sew-in day. I love scrappy quilts in all shapes and forms, but I think two colour scrappies are my favourites. I used a new pantograph for this one, called Blossoms , designed by Patricia Ritter. 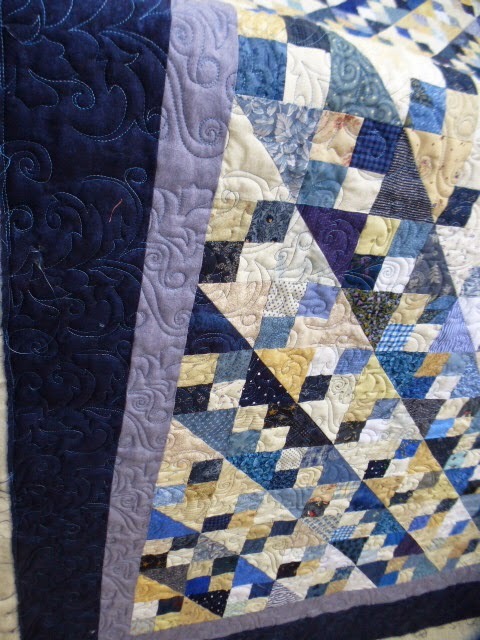 It has lovely leaves and swirls in it that give a lovely texture over the surface of the quilt. I'm going to have to remember this quilting design and use it more often. It's been a while since I've done an update on the various projects I'm working on. I have 2 major ones on the go right now. I'm finishing up the piecing in Three of a Kind. The center is all together. All that is left are the borders. I have some piecing left to do on one of them, but it shouldn't take too much longer to get this done. It's my UFO assignment for May, so I'm cutting it rather close. The other thing I'm working on is the quilting for In Full Bloom, a design by McKenna Ryan. The tension on these has been giving me issues. I love these quilts, and the detail possible because of the fusible applique. My quilting machine, on the other hand, doesn't like them anywhere near as much. There are tension issues. Thankfully, although I can feel them, they aren't all that visible, and since this will be a wall hanging, I'm going to live with the tension blips. It's almost halfway done. Other than the aggravating tension problems, this has been a lot of fun to quilt. I've discovered that if I loosen the top tension and the bobbin tension about as loose as they can go, and use a much bigger needle than recommended, it reduces the problems, somewhat. The bigger needle leaves nasty looking holes in the fused pieces, but my research says that spritzing it with water will close the holes. I tried it, and it works. I'm linking up with Canada's The Needle and Thread Network and also with Lee's Work in Progress Wednesday. I am really hoping to have both of the projects done by the end of the month. So, with that goal in mind, I'm off to sew. This lovely wall hanging belongs to Charlene. She told me that this began as a bunch of triangle squares she made using Edyta Sitar's triangle papers. She just kept making all kinds of them until she had enough, and then some, to make these trees. She has since made another wall hanging just like this one, which was also quilted just like this one. There might be more of these trees, or something else using triangle squares coming from her, since she made so many of them, that she still has hundreds of them left. Now that's my kind of leftovers. LOL! Charlene said she wanted it quilted with something with leaves, so I used a pantograph called Botanical Gardens. She wanted leaves, and she got them. The texture from all the different leaves in the quilting design in the open spaces is wonderful! I think this is one of my favourite pantos, with the combination of pointed areas and curves in the same pantograph. I'm looking forward to seeing what she does with the rest of those triangle squares. Today I have a quilt that our guild is working on up on my wall. Our guild's quilt show is coming up in October. The theme is going to be "Road to Friendship" which is rather appropriate since the guild's name is the London Friendship Quilters Guild. And, as it happens, there is a quilt block out in the public domain called London Roads. We have gotten permission from the city to hold a raffle in order to raise funds for our outreach works. We gift quilts to the London Children's Aid Society and also to Quilts of Valour. The funds from the raffle will go towards purchasing fabrics and batting for these outreach quilts. We asked the guild members to donate these blocks, with the guidelines being red and white, to represent Canada. So far, we are 3 short for having an 8x8 layout. The blocks are 9 inches finished. Then there are going to be borders added to it. A narrow red, probably 1.5 inches, then a 3 inch red and white print border and then another 1.5 inch red border. The lay out needs some tweaking, but we can do that after we get the last 3 blocks. There are supposed to be some more coming in at our Banquet on the 12th of June. After that, a group of us will get together to sew it up, and then I'll get it quilted and bound. The final size of it will end up about 84 inches square. I'm a day late with the scrappy Saturday post. It has been so gorgeous outside the past couple of days that I haven't wanted to spend one minute more indoors than I had to. We went on a bit of a road trip yesterday. If I was a super dedicated blogger, I would have taken my camera and taken pictures on the way. As it is, I didn't even think about it until just now, sitting here typing this. We went on a stash enhancing expedition. I needed some off white, but as close to white as off white fabric can get, for my leader/ender Irish Chain. I also needed some backing for Cactus Rose. I found some in the first shop we went to that I thought would work, and bought it. But then we went to another shop and I found a pale green batik that is almost an exact match to the pale green fossil fern that I used in the quilt top. So it came home with me as well. The other one will make a good background for something. However, all that meant that there was no sewing going on during the day. I did, after it got dark, come inside and cut enough for 16 four inch bow ties and 12 six inch bow ties. I can use them for the next week as leader/enders. I probably should have taken the cutting mat off the table before trying to take a picture of green fabrics on top of the green cutting mat. Oh well, you get the idea. I've been working on finishes this past week. The backing for In Full Bloom is done, and ready to load onto the machine tomorrow. I've also made really good progress on Three of a Kind. I'm at the point of sewing the center section together, and all the cutting for the rest of the borders is done. Makes for good numbers. However, I think yesterday's enhancement trip put me over the top again. Well that is a surprise. I thought for sure I was going to end up with more added than used this time round. I'll take it, even if it is only by half a yard! I'm linking up to Judy's Stash Report and also to Scrap happy Saturday. It's a good thing there are 5 Saturdays this month. Gives me another week yet to get the pinwheel blocks done. warm and soft and oh so comfy. I don't want to take it off. But, that will give me the motivation to do the boring chore of sewing in all those loose ends and get it blocked so I can really wear it. Sometime this summer, I will try and get Scott to take a picture of me wearing it while standing beside the sign of the park for which this sweater was named by the designer. In the meantime, I've been working on a pair of socks. I did a lot on these while we were holed up in the trailer last week, during our extremely cold camping trip. It's an Opal yarn, but I don't know the colour name. And the a couple of days ago, I started the cast on for a new sweater. It's going to be a challenge because it has some new techniques in it, starting right off with a provisional cast on using a crochet hook and a backwards loop cast on. It will be a lovely warm sweater, made out of the same Malabrigo worsted weight yarn I used for Pinery, only in a lovely green. The pattern I'm using is Flyaway hoodie. Obviously, it doesn't look like much, yet. The socks are my take along, don't have to think much project. This sweater, on the other hand, is going to take lots of thought. But I love doing new things. It keeps my almost 60 year old brain from getting any more befuddled than it already is. I originally started another sweater using this green yarn, See You There, which is another hoodie. But, after doing the first repeat for the cable design, discovered that the design wasn't going to show up using this green coloured yarn, so I ripped it all out. I might just have to see if the is a cream coloured malobrigo, so I can do that sweater too. 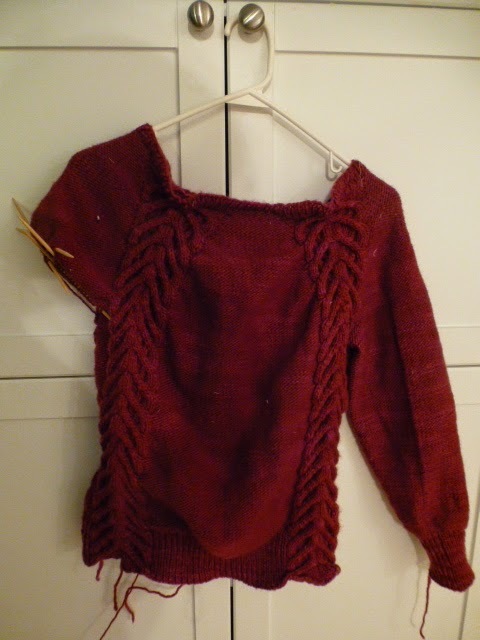 I'm linking up to Judy's On the Needles.There are lots of fun knitting projects to see. I always find at least one that I want to add to my ever growing knitting wish list. This gorgeous quilt belongs to Amalia. I believe it is an Edyta Sitar design that she did while participating in a "Laundry Basket Quilt Club" at one of the local quilt shops. Amalia uses the most gorgeous batiks in most of her quilts, and this one is no exception. The border fabric is fabulous, with those pink birds and leaves. I used a pantograph called Northern Star for this one. Unfortunately, it is really hard to see the design, due to the indoor picture. This quilt was actually done back in February, which shows just how far behind I am in documenting about all the wonderful quilts I have worked on in the past few months. I am going to make a concerted effort to post at least a couple of time a week about these quilts until I get caught up. There, I've said it publicly, now I have to do it. Me: Hello my angel boy!! Avery: I'm not an angel, I'm a train. I'm Molly. Molly is one of the trains on the Thomas the Tank Engine series. But, whether he was my angel or a train, I still got him out of the car and gave him lots of hugs, a bunch of kisses and just a few tickles. We came back home yesterday, and spent today doing all the post being away for a week things, like groceries and banking and laundry. Tomorrow, I get back to work at doing quilts. a topper for his window, and a really cute pair of pajamas, although, he could wear the pajamas as regular clothes if he wanted to, I suppose. Tomorrow, I have to spend quilting and then Wednesday, we head up to see them for his birthday on the weekend. I am really hoping the weather forecast is wrong, since it is predicting 7 celsius up there on Friday. Just a tad chilly for camping out. Good thing for trailers and heaters. We went on a very brief camping trip this weekend. Left yesterday and came back today. The main reason for going was to be able to open up the trailer and do all the draining and flushing that the plumbing system needed. Last fall we paid to have our trailer winterized, but decided that we really needed to know how to do that kind of maintenance ourselves, so we did the de-winterizing ourselves. It wasn't difficult, just time consuming to empty the tanks, then fill them to flush them, then empty them again and then fill them again to sanitize over night, and then drain them again and then flush again. But, although I don't think we really saved any money by driving up to the park and camping over night while we did all this, it was worth it to be able to enjoy the glorious weekend of weather. temperatures in the mid 20's Celsius, gorgeous breezes and blue skies. We went for a long walk along the river, watched some beavers swimming around and listened to lots and lots of birds. I really wish there was an easy source to find out which bird call or song goes with what bird. I heard a few that weren't at all familiar, but couldn't actually see them to get any identifying features on them. 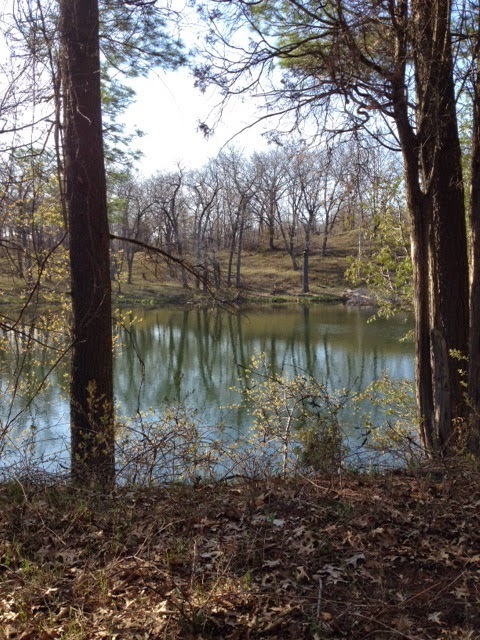 The leaves are just starting to bud out. A couple of weeks from now all the trees on the opposite side of the river in this picture will be full. If I didn't know that the weather is supposed to turn wet and cold this coming week, I would have had a really hard time coming home. But that's OK, we set out again on Wednesday to go and celebrate Avery's 3rd birthday. Unfortunately, Thursday is the day it is supposed to turn cold, but maybe it will change by then. I've been doing some sewing for his birthday, so the usage numbers for stash are up, and nothing came in this week. We had our last regular guild meeting of the year last night, and that was the meeting for handing in our "A Road Runs Through It...." challenge pieces. This was mine. A lovely trailer, in a lovely campsite, with the road running by it and then out the other side. The guidelines of the project stated that the piece had to be 60 inches around the perimeter, and have a road entering on one side of the piece and exiting on the other. The entrance and exit measurements of the roads had to be 2 inches wide. All of the pieces were lined up with the roads meeting. I wish I'd remembered to get a picture of the whole thing. This piece of paper to the left is the reason that I floated all the way home from the meeting. I won an award for it, for the "best quilting as an enhancement of the overall piece"!!!! I've never won an award for anything before! It was so thrilling, and I'm still grinning about it! This was a McKenna Ryan design that I adapted for this purpose. The original had a tent where the trailer now stands, and a bear climbing the tree. The design is found in her Out and About series. I found the trailer in the last Quiltmaker 100 blocks edition, designed by Kristy Wolf. I shrank her trailer a bit to get it to fit on this campsite, and added the road. To add to the excitement of the evening, my husband Scott and our son Noel had gone to a meeting at the Art Emporium in Port Stanley. Noel has pieces hanging there already, and has had people express an interest in his work. And Scott submitted some of his work, and they liked it, so he will be exhibiting art work there, as well. Edit: I need no longer put off doing button holes. This Janome of mine whipped out those 4 button holes so easily in flat out time. Whew..... what a relief! Three of a Kind, a design by Judy Martin remains up on the wall today. It is slowly growing. There are four of the main squares left to sew up, and 26 of the single border units to make up. After that, it's time to put it all together. I'm really enjoying the depth the optical illusion develops in some of the blocks. All of my other deadline projects are done, with the exception of some hand stitching on my A Road Runs Through It..... challenge piece for the guild. So, this project here has moved to the top of my getting it done challenge for the month. The only other things I have that need to be finished by a certain date are Avery's birthday gifts. His Thomas the Tank Engine pillow case is done. And his pajamas are all cut out and ready to put together, probably on the weekend. I have enough of the pillow case fabric left to do a topper for the window in his room, as well. I just need to remember to get the measurement for it. There, I just texted Laurie asking for the measurement., so now I don't need to remember to do that any more. I'm going to Link up to Judy's Design Wall Monday and also to the goal setting party for A Lovely Year of Finishes. Then, I'm going to work on doing some more Three of a Kind blocks. I would love to have this finished way before the end of the month. I'm late, as usual, getting my Scrappy Saturday post written so, as usual, I'll combine two in one. 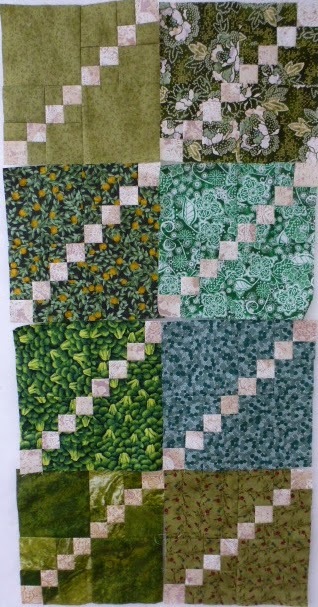 I finished my eight triple four patches in this month's colour of green at about 9:30 last night. I had all the stuff cut out on Friday, but no time to work on them until yesterday. With all of the distractions, this contraption I am currently typing on being a major one, it was late when they were finished, and my brain wasn't functioning well enough to write, so I decided to follow my usual pattern, and delay writing it until tomorrow, which is now today. I'll link this up to Scrap Happy Saturday. As for stash use, just a little bit went out, and nothing in. Once I get to the point where all the blocks for Three of a Kind are done, the totals will go up, because there is a big wide border in it. In the meantime, I'm back into positive stash used numbers.... barely. That net used amount will be going up more this coming week, as I cut into the Thomas the Tank Engine fabrics for Avery's third birthday, which is coming up in a couple of weeks. Two pillow cases and some pajamas are on my to-do list for this week. I'm linking to Judy's Stash Report, and then I'll cut some pillow cases. It's been a while since I did a knitting post. Not because I haven't been knitting, but because I seem to always be knitting on the same thing. 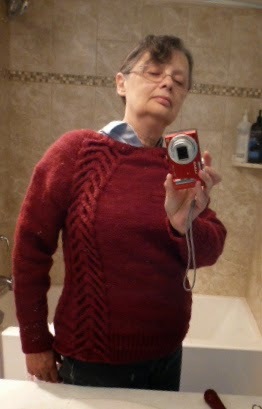 However, I am now only one sleeve and fixing the neckline away from being done this sweater, called Pinery. If I keep at it, in my spare knitting moments, I just might have this done in time for our first camping trip of the season, later on this month. In the meantime, I've been plugging away at projects that have deadlines, but that I can't show yet. The deadlines are for the May guild meeting. Somehow, I had it figures that the meeting was on the 15th of this month, so I had a couple of weeks left. WRONG!! The meeting is on the 8th, so I've been scrambling, just a bit, to get these things done. Hence, no blogging between Monday and today.